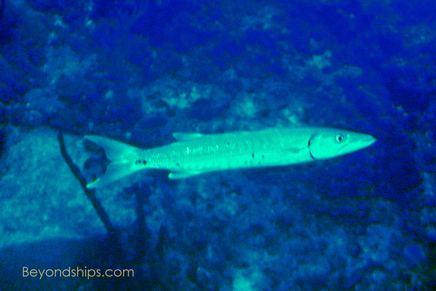 Above: A young barracuda passes by. 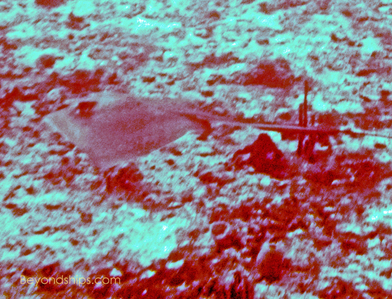 Below: A sting ray blends in with the surroundings. The depth gage at the deepest point of the dive. Atlantis XII waiting to make her next dive (below). The interior of the submarine was a single long, narrow room. At the front, the “pilot” sat surrounded by instruments and a great glass window. He was the only one seated looking forward. The passengers sat shoulder to shoulder in two rows running the length of the room. One row faced the windows on the port side while the other faced the windows on the starboard side. Next to each window was a chart with illustrations of various species of fish. But no one seemed to pay much attention to the chart. From the moment they sat down, the passengers were transfixed by the view out the window. 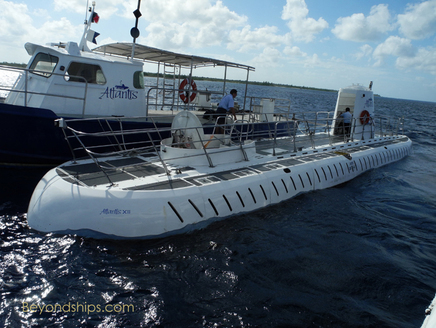 In any event, a guide speaking over the submarine’s public address system pointed out by name the various types of fish and other sea life that we encountered. There was quite a variety of sea life. 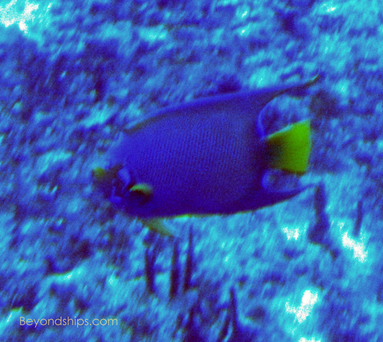 In addition to numerous types of coral - - 26 different classes live in the vicinity according to Atlantis - - we saw schools of snapper, groupers, sergeant majors and other brightly colored fish. To add a bit of excitement, there were barracuda, sting rays, a sea turtle and even a few sharks. The water was clear and you could see some distance. However, objects further away lost their color and faded into a general blue haze that eventually merged with the white sea bed. 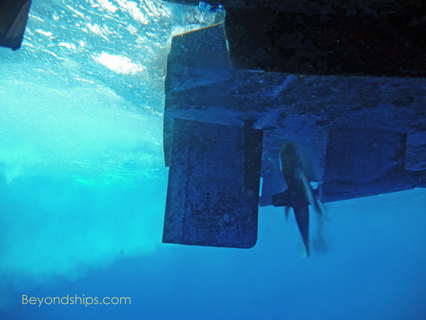 At first, the sub dove to approximately 40 feet and traveled along the reef. The pilot maneuvered close to the large coral heads so that they were seemingly only an arm’s length away. 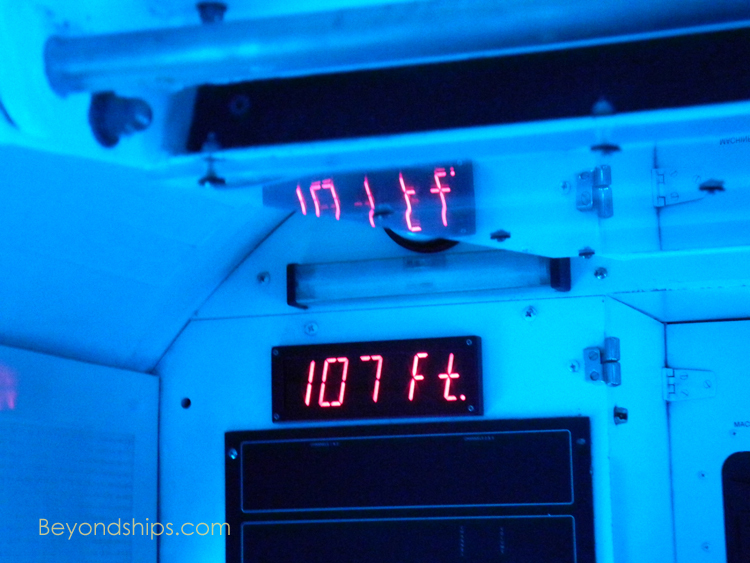 Then the Atlantis XII dove to 107 feet. Our guide said that this was well-below the depths to which all but the most experienced scuba divers descend. Finally, we traveled off the shelf and were able to look down into the abyss that reportedly extended more than 1,000 feet below. Well above that depth the water became a dark blue cloaking whatever lay below. In total, the submarine was underwater for approximately 40 minutes. Throughout that time, there was a general feeling of excitement as people pressed close to the windows searching for sea life and taking in the sights of the deep. As we reached the surface, there was a flurry of air bubbles outside and we could see the propellers of the tender turning next to us. The hatches were opened and the crews of the submarine and the tender assisted the passengers from one vessel to the other. In the tender, we found another group of people who then transferred to the submarine for its next dive. On the way back to the cruise port, the tender crew distributed complimentary cups of rum punch. Also on offer were souvenir photographs of the passengers which had been taken at the start of the voyage when we boarded the tender. Last, but not least, were certificates (in Spanish) testifying to the fact that we had explored the depths on an Atlantis submarine.